TAt Computex in Taipei, Microsoft today announced new Windows Collaboration Displays from Avocore and Sharp. The company says this is a ‘new category’ of devices with Windows 10, and it’s supposed to empower employees and offices around the world. 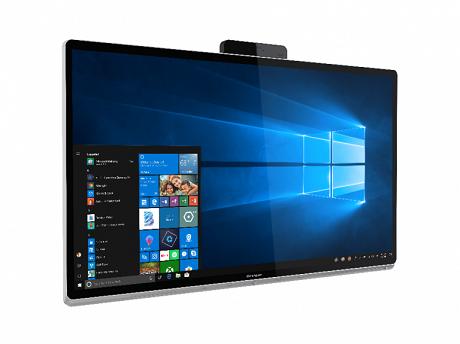 With Windows Collaboration Displays, the partners are taking the Surface Hub 2 to the next level. The partners are developing the Windows Collaboration Displays and it works just like the Surface Hub. The devices would allow the employees to leverage Office, Teams, and Whiteboard at room scale, and it works more or less like the Surface Hub 2. Microsoft partners Avocore and Sharp are getting into the business of large Windows PCs, and more OEMs including Lenovo will join the push in the coming months and years. The employees with the Windows Collaboration Displays will be able to use apps and services powered by Microsoft 365. The first-generation Windows Collaboration Displays from Sharp features a 70-inches large display. It also comes with a high-resolution conference camera. The other details of the hardware are unknown at the moment. At the same event, Microsoft also announced a new version of Windows 10 IoT Core, called IoT Core Services. Core Services is a paid software and the devices using this new option will be provided with 10 years of support. The Core Services would help enterprises focus on stability, and it also comes with Device Health Attestation (DHA) that would allow business to the raise the bar for security. The company also praised the Intelligent, Microsoft Office 365 and other advanced services aimed at enterprises. As noted above, not much is known about the first-gen Windows Collaboration Displays. What do you think about Windows Collaboration Displays? Let us know your thoughts in the comments below.